President Trump broke his Twitter silence Saturday after being criticized for his silence as protests turned violent at a white nationalist rally in Charlottesville, Virginia. Mr. Trump tweeted that all Americans must condemn hate and violence, without mentioning the Charlottesville incident directly. The "Unite the Right" rally erupted into chaos Saturday morning, resulting in fights, tear gas and injuries and prompting Virginia's governor to declare a state of emergency. Some in the crowds featured Nazi symbols and spewed anti-Semitic rhetoric. 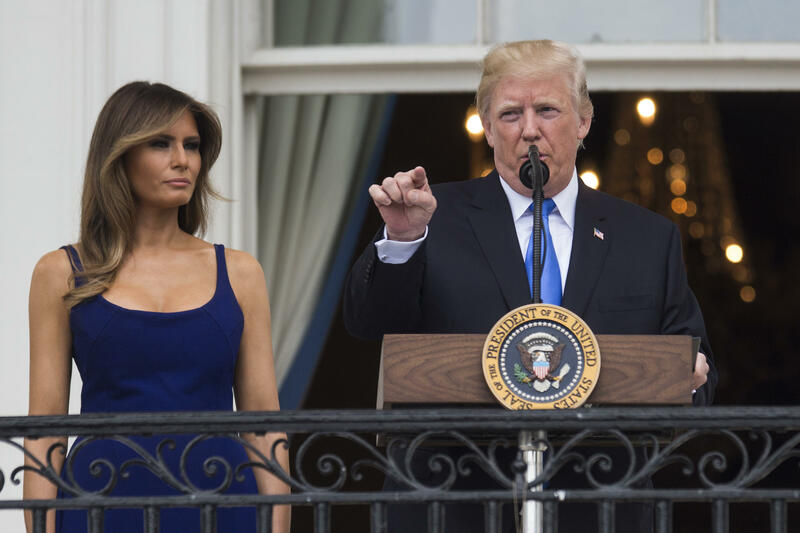 First lady Melania Trump responded to the violence before the president did. Mr. Trump is currently on a 17-day working vacation in Bedminster, New Jersey. The "Unite the Right" rally was originally a reaction to the removal of a statute of confederate general Robert E. Lee from a public park. Speaker of the House Paul Ryan issued a statement condemning the "vile bigotry" just before noon. House Minority Leader Nancy Pelosi (D-California) called on the country to reject hate. But Mr. Trump's delayed response was quickly noticed by Democrats in Congress. "Silence speaks loudly," tweeted Rep. Mike Quigley (D-Illinois). Sen. Patrick Leahy (D-Vermont) called the president's initial silence "defining." President Trump's silence as #Charlottesville roils with racist and fascist provocation is shameful, irresponsible...and, DEFINING. While Democrats were generally quicker to respond to the Charlottesville violence on Twitter, Republicans also condemned the day's events. Rep. Justin Amash (R-Michigan) called for Americans to stand against racism. Racism is vile and the #Charlottesville rally is disgusting. Let's stand as Americans for the self-evident truth that all are created equal. Sen. Cory Gardner (R-Colorado) said the "hate" spewed in Charlottesville is "un-American." The hate being spewed in Virginia has no place in this country. It's deeply disturbing and un-American. Rep. Cathy McMorris Rodgers (R-Washington), chairwoman of the House Republican Conference, explicitly called out white supremacy and its supporters. My prayers are w/ #Charlottesville. Let's unite in standing against white supremacy and bigoted violence-it's repulsive & has no place here. The rally came shortly after a large group of torch-bearing white nationalists marched through the University of Virginia (UVA) campus Friday night, after a judge issued a ruling allowing Saturday's protest to move forward.